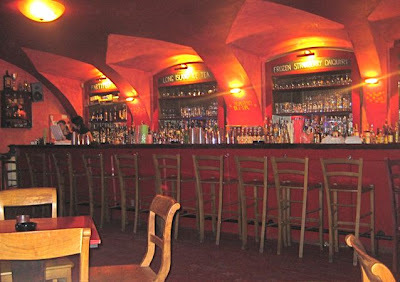 We were wandering around Mala Strana, and V decided to reveal another one of her secret watering holes. By secret, I mean I didn't know about this particular cocktail bar or that she'd been there many times. Maybe it sounds strange, but I'd never heard of ZanziBar. 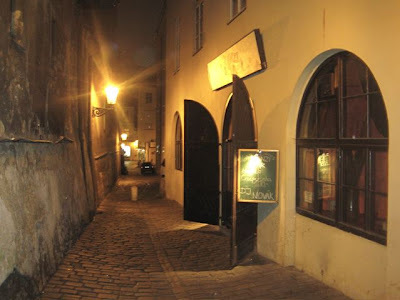 I say strange because it has been around a long time, and it's an area I've walked through hundreds of times, near the Charles Bridge. To be fair, it is tucked in an alley called Saská, and it is hard to see the sign, so it is easy to miss. I'd think it could get very touristy because of the location. But on this weekend evening at 8:00 pm, it was almost empty. The few taken tables in the back were filled with Czechs. I did see an unmanned DJ station, so I could imagine it could get a bit more lively later in the evening. After a few minutes, a waitress came over and took our drink orders. I requested a Gimlet (130 CZK). I forgot to specify that I wanted the classic version with gin. This one was vodka. It was very good, so I didn't bother to return it. At Buddha-Bar, when I ordered a Gimlet, the waiter immediately asked me, "Vodka or gin?" 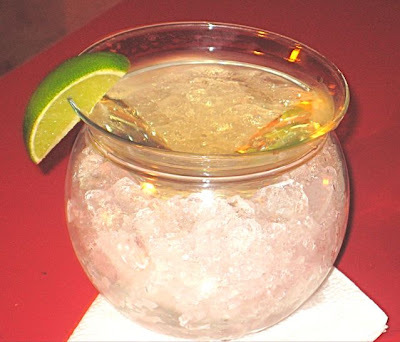 A martini glass without a stem was placed in a little bowl full of crushed ice. On the one hand, sipping from this glass felt kind of ridiculous. On the other hand, it did keep the cocktail nicely cold. V got a Kir Imperial -- Creme de Framboise and champagne (120 CZK). It was not very good -- fairly flat and not cold enough. After we finished our first round, we sat waiting a long time for service. There were two waitresses sucking the straws on their own cocktails behind the bar. One was sharing the story of her recent engagement. Riveting stuff. We were the only ones in this room, sitting in clear view of the bar. It was one of those mystical, mystifying Harry Potter-like moments. We could see and hear them, but they couldn't see us. V, the poor lamb, was overcome by thirst and began waving her arms back and forth over her head -- the internationally recognized distress signal. Just then, the barman walked back into the room and alerted the waitresses. One came over. She looked unhappy that our cloak of invisibility had been lifted in the middle of her story. She took our order with a sour look on her face. V explained politely that we had been waiting quite a while to order something else. This just seemed to annoy her. While we were waiting for our order to be filled, two shots arrived at our table. It was a gift from the bartender, who had saved us from our alcoholic exile and sought to make amends. It was an unusual but tasty potion -- vodka, almond liqueur, and lime cordial, I believe. I liked it, but I do have quite a sweet tooth. I drank my shot and my spirit was filled with the warmth of forgiveness. For my next drink, I decided to keep with the lime theme and tried the mojito (130 CZK). Very good. The price was fair, too. 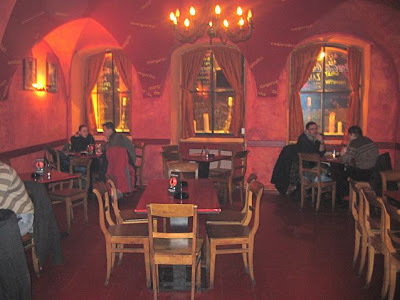 At La Bodeguita del Medio, they cost 169 CZK. 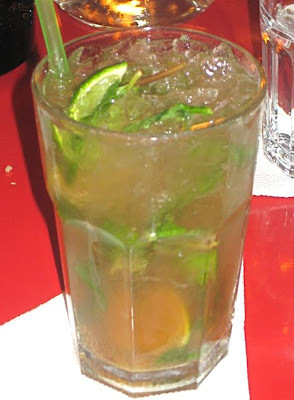 A problem with many mojitos in Prague (the town's most popular drink), including La Bodeguita's, is that they aren't mixed well. You get a big pile of brown sugar at the bottom of the glass, and the limes aren't well-squeezed. ZanziBar's was well-mixed. 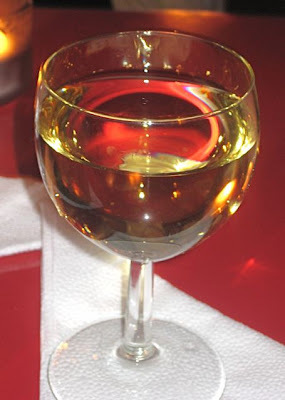 V decided to have a glass of Czech white wine (45 CZK). Nothing special, but also a decent price, especially for a cocktail bar. The bill for our four drinks came to 425 CZK. I liked my cocktails, and I liked the prices. I'd like to go back some time at a later hour to see what the atmosphere is like and what kind of people this place pulls in. I just won't expect a smile from the waitress -- secret or otherwise. Funny .. that place is always empty when I go there too, though I remember several years ago it used to be packed. The price is great at about 15 euros. 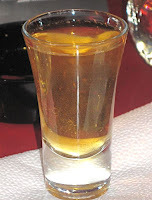 I went out for cocktails last week in Bratislava and had four drinks (between me and a friend) and the bill came to a whopping 50 euros. I met with some colleagues here a few months back. I have to say, this place didn't do it for us in the slightest. The music was not interesting, with a play list like one of those mainstream party mixes with songs from Britney Spears and Beyonce. It wasn't new enough to be cool and wasn't old enough to be kitschy. Just lazy and uninspired generics. Whats worse is that it was so loud that we basically had to yell over the table to talk to each other. Thats understandable if you are in a dance club, but this places plays like a cocktail bar. You should be able to hear people at your table at a reasonable enough level. The price of cocktails was off-putting. I ordered a Cuba Libre, and I believe it cost in the neighborhood of 130-150kc and it came in a small glass, probably three deciliters. I should have ordered a bottle of coke for 40kc and a shot of rum for 70kc, then stolen a lime from the bar. I would have gotten more drink and spent less. I decided to switch to overpriced beer instead. There is no way I'd drop 150kc on a Cuba Libre in a place like this. What topped it all off was the bartender coming over to our table with a tray of shots. It was a nice gesture to offer the table of people who had been buying overpriced drinks for several hours, although I'm pretty sure that he just wanted to flirt with the girls in our group (fair enough). We took the shots with him and thanked him for the drinks. As we were leaving the place, a friend of ours was stuck inside for several minutes. Eventually she walked out steaming mad, saying some pretty bad words in Czech. Turns out that the round of shots that the bartender gave to us were not complimentary. No one remembered ordering them in our group, but our friend had paid the bill anyways, as the bar staff was quite insistent about someone picking up the tab. So yeah, thumbs down to Zanzibar on several levels. There isn't a redeeming quality to the place, if you ask me.